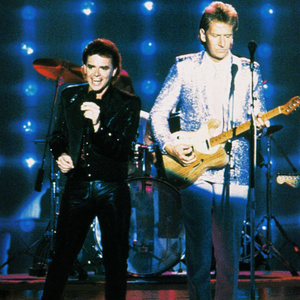 Air Supply is an Australian soft rock duo, consisting of Graham Russell as guitarist and singer-songwriter and Russell Hitchcock as lead vocalist. They had a succession of hits worldwide, including eight Top Ten hits in the United States, in the early 1980s. They formed in Melbourne, Australia in 1975 and have included various accompanying musicians and singers. The two met in May 1975 while performing in the Australian production of the Andrew Lloyd Webber/Tim Rice musical, Jesus Christ Superstar. Their 1980 album, Lost in Love, contained three U.S. Top Five singles, including the title track (a U.S. #3), plus "Every Woman in the World" (#5) and "All Out of Love" (#2). The album sold two million copies in the U.S. The following year they released The One That You Love, and the title song was released as a single and went number #1 on the Billboard Hot 100. It also featured two other Top 10 hits, "Here I Am (Just When I Thought I Was Over You)" and "Sweet Dreams". A fourth single "I'll Never Get Enough", co-written by Jeanne Napoli, Gary Portnoy and Judy Quay, was released in Japan and achieved Top 10 status. Their third album, in 1982, Now And Forever, continued the group's popularity with the Top 10 hit, "Even the Nights Are Better" and two top 40 singles "Young Love" and "Two Less Lonely People In The World". In 1983, they released their "Greatest Hits" album with a new single called "Making Love out of Nothing at All" written by Jim Steinman. The song was one of their biggest hits ever spending three weeks at number 2, and the album eventually sold 5 million copies. On August 21, 1989, using their old producer and welcoming the return of drummer Ralph Cooper, the duo decided to enter the studio again to record The Earth Is, which was released in 1991 by Giant Records under Warner Brothers. The recording contains their hit single "Without You," along with singles for "Stronger Than the Night" (with a music video announcing that Air Supply was back) and "Stop the Tears." Inside the album is a note about Russell Hitchcock and Graham Russell's original Musical Director of their meeting place during Jesus Christ Superstar (and long time Band Member/Orchestrator): "This Album is Dedicated to the Memory of Frank Esler-Smith." The album was followed by The Vanishing Race in 1993, which was supported by the hit single "Goodbye" produced by David Foster, (Barbra Streisand, the rock band Chicago, Josh Groban, and Celine Dion), with lyrics written by a former girlfriend of Elvis Presley (David Foster's current wife) Linda Thompson--which, although not popular in the United States, was critically praised and gained a large following outside the country, especially in Asia where in many countries they would reach number #1. This would lead to another world tour in 1993. "It's Never Too Late" was another single released from the Vanishing Race. The album itself was dedicated to the plight of the American Indians, the "Vanishing Race" of the album's title. Air Supply at the Subic Convention Center, Philippines on June 12, 2008. In 2006 they released an acoustic album, The Singer and the Song, and are gearing up for the release of their first studio album in three years, Zed. In support of the acoustic album they made their first trip to India in May 2006. December 2, 2006 saw the duo perform to a capacity crowd in Kingston, Jamaica. This was their second visit to Jamaica, having performed at the Air Jamaica Jazz and Blues Festival in January 2006. They also have been seen endorsing Time?Life's Classic Soft-Rock Collection. In 2007, Graham Russell released his first adult contemporary solo album called The Future.